Motorola is probably the first non-Google branded smartphone brand which delivers Android updates pretty quick to their devices. When Nexus 5X and 6P was launched, many OEMs announced the Android 6.0 Marshmallow upgrade for their devices and no doubt, Motorola was one of them to declare the list of devices that will get the Android 6.0 Marshmallow upgrade. Now, I’m pretty convinced that soak tests have begun for Moto G 3rd Gen and Motorola are rolling out the Android 6.0 upgrade to the latest Moto G 3rd Gen devices. A Moto G user and community member Ajmal Khadar posted on Google+ that his friend’s Moto G 3rd Gen has got the soak test Android 6.0 Marshmallow update on his device. 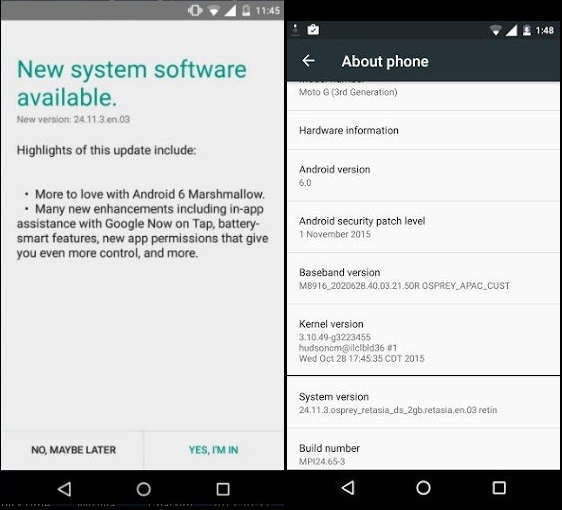 Well, Motorola has a different kind of policy for providing an update to their devices. Actually, it’s called soak test through which they will roll out the update to the Motorola users who are part of the Motorola Feedback Network. When the community members try it out and provide feedback, they work on various aspects and try to improve it. When the soak tests are finished the update is rolled out to public. Well if you are Motorola Feedback Network member you can try checking for the update manually. When you tap on About Phone>System Updates you may see that a new update is ready to be downloaded and installed. Just tap ‘I’m In’ and let it be downloaded. When it is downloaded you can install it, the phone will reboot once during the installation and later you can confirm the version by checking About Phone section again. According to the community members, they have noticed that there is the mention of the Android 6.0 Marshmallow and also other features like app permissions, Google Now on tap, smart battery features etc. Apart from these, a few more features are expected in the Android 6.0 Marshmallow on Moto G 3rd Gen. Some of the expected features are customizable Quick Settings tiles, Deep Linking, Direct Share, support for using SD cards as default storage, automatic app data backup, ability to hide heads-up notifications, improved Phone Dialer, and Contacts app and a few more tweaks. What do you think? Will it be a great upgrade or just as little as they mention in the update dialogue box? Let us know in the comments section below.